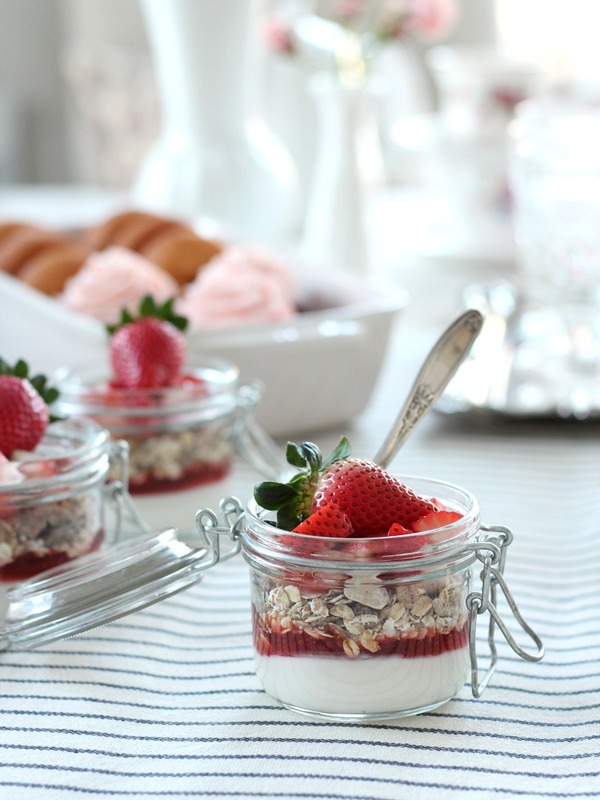 Strawberry yogurt parfaits are an easy and delicious way to start Valentine’s Day. 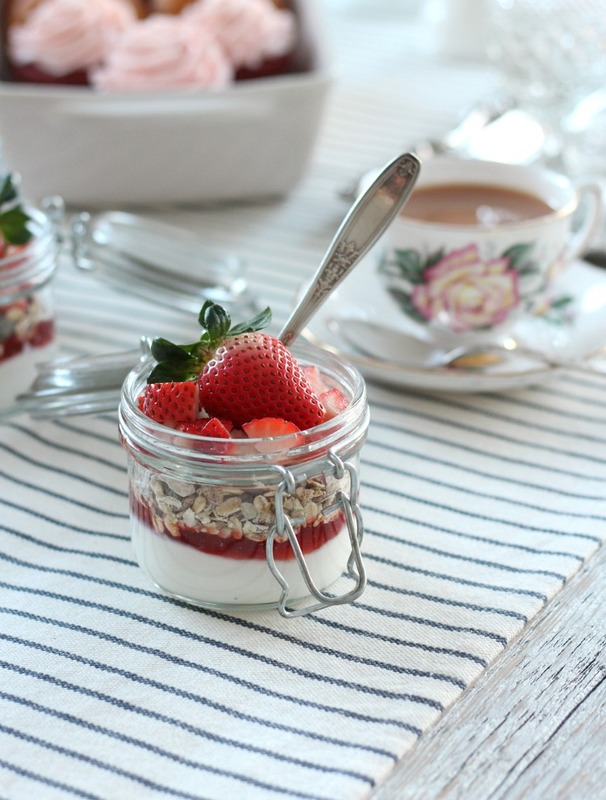 Whip up some jars for breakfast, school lunches or as a wholesome snack! 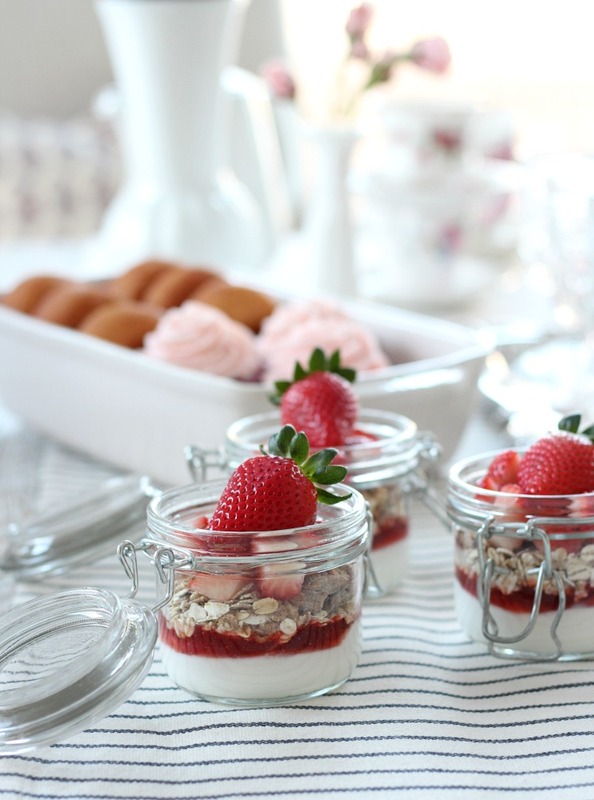 I wasn’t going to share these strawberry yogurt parfaits with you today because they seemed much too simple. But, lately, I’ve come to understand that we all need some quick and easy ideas from time to time. Are you with me? The beginning of the year is always a little slower for me than how it ends (with the craziness of the holiday season). I have much more time on my hands to make Valentine’s Day treat bags or bake chocolate chunk skillet cookies or tackle other DIY projects. Maybe that isn’t the case for you right now. Valentine’s Day parfaits, that can be thrown together in minutes (or even the night before), may be all you have time for. These yogurt parfaits are perfect for breakfast, kids’ lunches or afternoon snack. Pass them out to friends or co-workers on Valentine’s Day to show your appreciation. Originally, I put a bunch together for my GALentine’s Day tea party. The idea stuck, and now we usually have some grab-n-go version of these yogurt parfaits in the fridge on a regular basis. I’m really working on being more organized like that anyway. We all tend to reach for what’s easy (don’t we? ), so it’s good these are packed with protein, fibre and nutrients. Ready for this easy yogurt parfait recipe? Start out with a generous scoop of plain Greek yogurt, followed by reduced-sugar strawberry jam, a layer of muslei, all topped off with fresh cut strawberries. No measuring required. Easy peasy! Keeping with the Valentine’s Day theme, I also garnished each jar with a whole strawberry. Chocolate dipped strawberries would be delicious too! Play around with your yogurt parfait ingredients. If you’re using sweetened or flavoured yogurt, you may want to omit the jam or switch it out for something else. Eat right away or store in the fridge for up to 3 days (depending on your ingredients) in an airtight container. 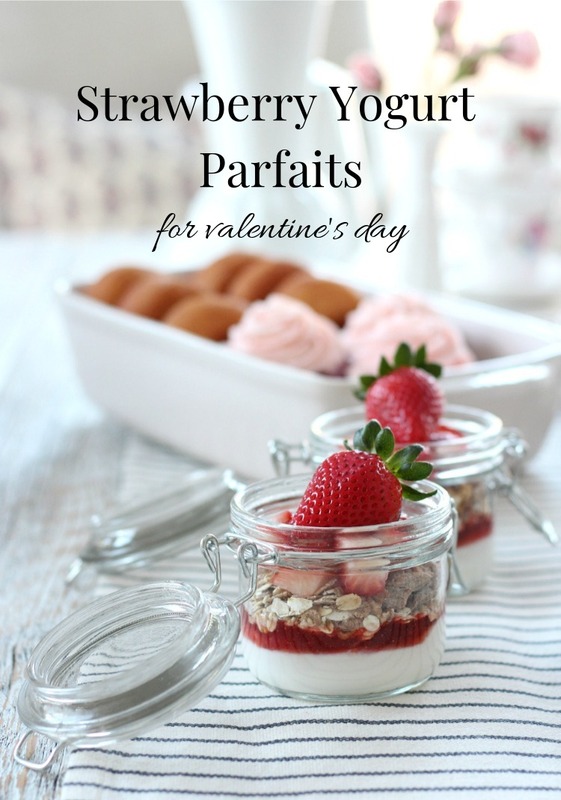 Pin these Valentine’s Day Yogurt Parfaits for later! Shauna! Thanks so much for stopping by the Homestyle Gathering Link Party. It’s so fun to have you here! :) I love your beautiful ~ and simple ~ Valentine’s parfaits. I love anything that’s simple in the kitchen. :) Have a great week. I love these little parfaits, Shauna! I’m all for grab and go and even better when it’s something on the healthier side. Thanks so much for joining us and sharing these over at Homestyle Gathering. These look amazing, Shauna… Love the photography, too! So inspiring! Thanks for sharing your grab-n’-go parfait idea, Shauna. Lately I’ve been having yogurt and fresh-cut fruit with chopped nuts for breakie, but to take it to the next level and actually prepare ahead like this makes so much sense! Love it! !